About the benefits of quail eggs is spoken everywhere. Almost any sector can contain a few dozen quails – place they need a little and to provide good conditions for egg laying not very difficult. If the birds you want to have only in order to get useful eggs, the males take no need at all. It will be enough to acquire females of hens at the age of one and a half to two months. Quail begin to lay eggs very early – at the age of 40 days. If the weight of the birds reaches 90-100 grams, she is already able to bear. On the onset of puberty females you can guess by the fact that it starts making a quiet whistling. In the first month a female can carry a small number of eggs is from eight to fifteen in the coming months the walls will be about twenty-five pieces. The productivity of quail depends on the age. When the female just started laying, weight of one egg is about seven grams. Gradually, the mass of eggs increases, the two-month-old quail it reaches 10-12 grams. The day birds are of one egg. When the quail was demolished 5-10 pieces for a couple of days she makes a break for rest. For the year from one bird to get three hundred eggs, each of which is by weight approximately 18 grams. The small size of the quails did not prevent them to carry quite large eggs – their relation to body weight is approximately 7.6%. Pereopylenie eggs have the following dimensions: length of 27.2 mm, a width of 22.5 mm. the shell thickness is 0.22 mm. the Color of eggs can vary from dark brown, white, and blue to light yellow, with specks of brown, blue and black. The color of eggs can be affected by many factors. Some females lay eggs with pigmentation, which is typical for the species. But if the food or the contents of quails were any discrepancies or violations, quail will lay eggs with a different color. For example, if the egg was in the oviduct is very long, the shell does not have time to form as it should and it turns out thin, with a bluish tint. In cases of diseases of the oviduct the eggs turn a dark green. Quail tend to lay eggs around noon or late evening. Some can be carried out at night. The intervals between neseniai – about 30 hours. For comparison – the hens, this range is 24-27 hours. Oplodotvorennogo the eggs of quail is 70-85%. In the incubator the hatchability is obtained is quite high – 80-95%, nestlings begin to appear about the seventeenth day of incubation. 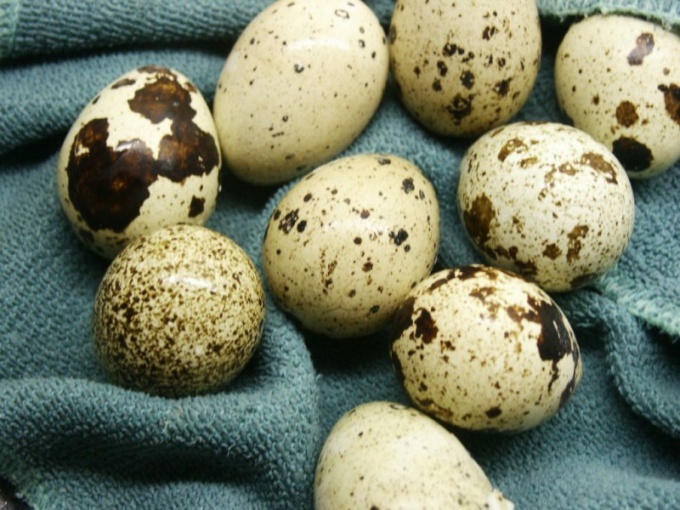 Quail eggs are an interesting feature: if desired, the color of the shell they can be easily washed off with detergents.